Being a healthy child is adult’s work, so when the little people in our lives are unwell we want them to feel better pretty quickly. The toddler years can be pretty difficult on the immune system: an average of 6-8 colds every year is considered normal, with infections lasting between 3-5 days. As they get older their immune system matures, reducing the frequency of colds and flu’s per year. If your toddler is getting sicker more often, or you find it takes them longer to get over illness, their immune system may be comprised and could do with some support. Did you know that our digestive tract holds up to 80% of our immune system? Our immune cells sit in the gut wall lining tasting and sampling contents of the digestive tract and it is these cells that mount an immune response to avoid infection, if they come across bacteria they haven’t encountered previously. This process is constant during the first few years of life to ensure we are able to protect ourselves from infections. Another major role of our digestive system is the digestion and absorption of our food and its nutrients. We use bacteria for these important functions and this is why we need a balance of ‘good’ to ‘bad’ bacteria, 75% of the good bacteria and 25% of the bad bacteria. This balance is crucial for the immune system to respond appropriately as the bacteria help the immune system react appropriately. A healthy balance of bacteria is essential for a healthy immune system and the prevention of allergies later in life. A baby’s first exposure to bacteria/microbes is during the birthing process. Before this the baby will have no exposure to microbes in the womb. As they are exiting the birth canal they take ‘gulps’ of the mother’s fluid, which is filled with bacteria that literally forms the basis of that child’s bacterial flora for life. Children born via caesarian skip this step and it is important to supplement with probiotics. Breast-feeding then further develops the immune response as important immune markers, beneficial bacterial and antibodies are passed onto the baby. While the immune system is fully developed at birth it is not fully matured. You could say that we are born with an imbalance in our immune response. Once we are exposed to both beneficial and bad bacteria our immune response starts to develop and mature. However due to our very germ conscious society, sanitizing soaps, antibiotics and vaccinations, it is now harder for our immune system to develop a balanced response. Kids need to play in the dirt, share their germs and literally get sick in order to have a healthy immune system. 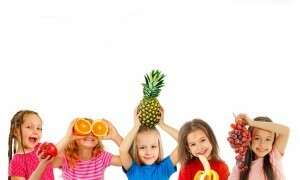 Children’s small tummies require 5-6 regular nutrient dense meals a day. Make these meals count by providing as much nutrition as you can. Eat all the colours of the rainbow. Aim for 3 serves of fruit and 5 serves of veggies, all in different colours. Different colours indicate a different nutritional profile. Making sure your children eat enough protein. Protein is essential for the immune system to function effectively. Eat milk, fish, chicken, eggs, meat, nuts, seeds and whole grains. Make sure they eat enough iron. Low levels of iron in toddlers is common because of their dislike for chewing red meat and greens. Eat 1-2 servings of red meat per week, green leafy vegetables, parsley, almonds, lentils, broccoli, black strap molasses, dried peaches, apricots and prunes. Encourage children to drink water rather then sugary drinks such as fruits juices, cordials or soft drinks. Even though they don’t need as much as an adult, it is still important that they get plenty of water. Make sure your child is getting enough sleep. Not getting enough sleep can make you more susceptible to illness, by reducing immune function. Remember movement and exercise is extremely important for children too! Avoid dairy products when your child is ill: dairy increases mucous formation so if your child has a cold dairy will only make it worse. Avoid anti-biotics where possible: Whilst antibiotics are essential in some cases, they only treat illnesses cause by bacteria and the majority of childhood illnesses are caused by viruses. Speak to us about a more natural approach to improving your child immune response. Vitamin C – The best immune booster for many reasons! Found naturally in many fruits and vegetables such as oranges, berries, cabbage, broccoli and kiwi fruits. Zinc – Is used in over 300 pathways in the body including functions in the immune system. Zinc is found in animal products, oysters, pumpkin seeds, sesame seeds, dark chocolate. Vitamin E – Stimulates and enhances the immune response. Sources include wheat germ, spinach tuna, and eggs. Carotenoids – Beta carotene is the most familiar carotenoid. It increases the number of infection-fighting cells, natural killer cells and helper T-cells. It is also a powerful anti-oxidant. But Beta carotene is only one member of a larger family. The body converts beta carotene to vitamin A, which itself has immune-boosting functions. Sources include green and yellow veggies, fruits, carrots and eggs. Bioflavenoids – Aid the immune system by protecting the cells of the body against environmental pollutants. A diet that contains a wide variety of fruits and vegetables, at least six servings per day, will help you get the bioflavenoids needed to help your immune system work in top form.